Since coming back from our summer holidays I'm now looking ahead to all things autumnal & loving the arrival of all the new season stock in the shops & online (perhaps loving a little too much according to the hubby....whoops!!). 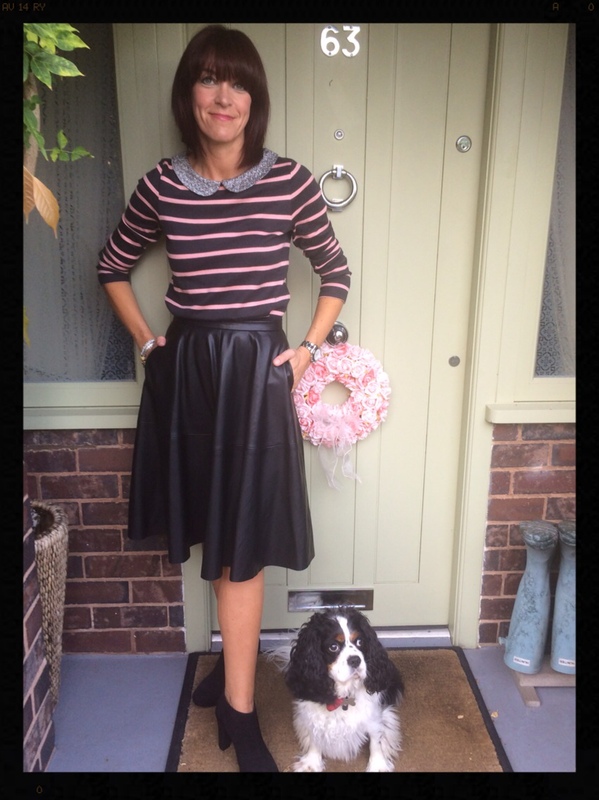 So when Boden kindly offered me the opportunity to choose a few items of their new arrivals to style I simply jumped at the chance. Of course before I could say what pieces I'd like to style I had to do some key research *drooling* at their new collection, lots of great additions it has to be said, which of course I'd already had a sneak preview at when I went to the press day (click here). In the end I decided to go for three items, which would not only make great additions to my existing wardrobe but can also be worn together to create a new outfit. So here's what I chose & for the eagle eyed amongst you I was so desperate to play dress up that these pictures were literally taken on the night before we jetted off on hols hence the pasty skin!!! First up this stunning tweed jacket. Yes I know I have far too many jackets but what can I say they're my achilles heel & I KNOW I will wear it! 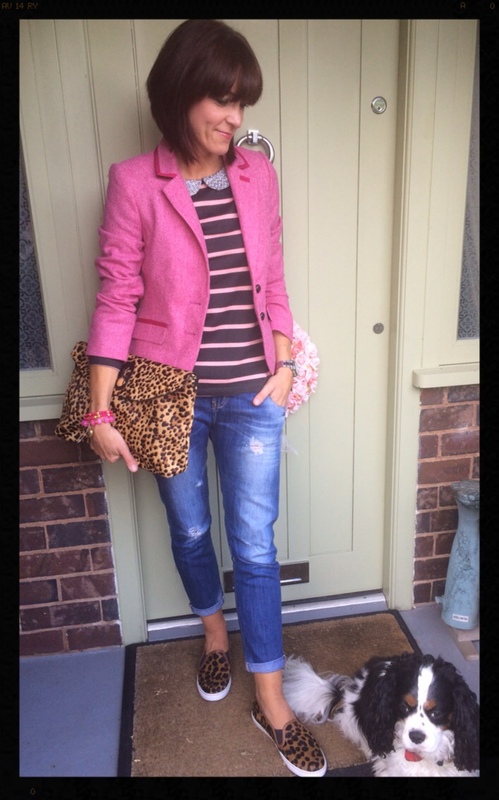 Plus you may have noticed from some of my recent outfit posts I'm currently loving everything hot pink & this jacket will be perfect for my new addiction this autumn/winter. One thing I would point out is that the edging of the jacket isn't purple as shown in the picture below but is fact in pink, which looks even nicer so a fab surprise when it arrived! The jacket is a lovely tailored fit & having tried two sizes on for comparison I went for my normal size, which will be plenty big enough for slipping a jumper underneath come the cooler months. 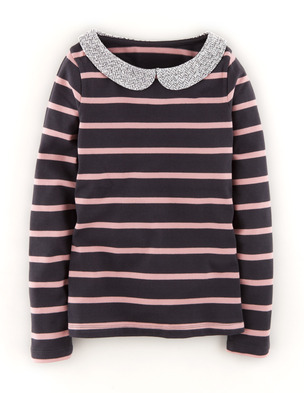 Having spotted the cream & blue sparkle collared breton at the press day I was delighted to see that they also did it in a different colorway too (raven and pink) which in case you're wondering the 'raven' is a faded black/grey. I sized up in the top as I don't like my t-shirt tops too tight & found the fit perfect being that little big bigger. This is going to be such a great & versatile top that I'm extremely tempted to order the other colorway too (see here). Lastly & by no means least I've caved & gone for some slip on trainers!!!! 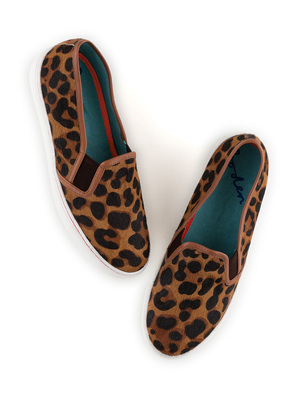 Yup I know I said I wouldn't be going down that route but when you see Boden making such beauties & in leopard print too my Bet-o-meter simply couldn't refuse & if I'm honest I was curious to see what all the fuss was about with this style of shoe. Again I ordered my normal size shoe & they fit perfectly & ok those of you who've said how comfy & easy a shoe they are to wear are TOTALLY right!!!! Plus I'm going on the lines that if Boden are selling them they must be 'acceptable' for us ladies in our 'prime' ;-) to be sporting on our tootsies!!! Of course as I mentioned earlier I had to have an immediate dressing up session as I was desperate to see if the three pieces would work together in a great mis-mash of patterns. So for a real pattern clash of tweed, stripes, leopard print & not forgetting the sparkles I've teamed them with a pair of distressed boyfriends for a great casual weekend look. As I've mentioned above I'm planning on getting a lot of wear from this stunning tweed jacket & just one of the ways I plan on wearing it is by teaming it with some distressed denim & a simple grey jumper for a great effortless look. 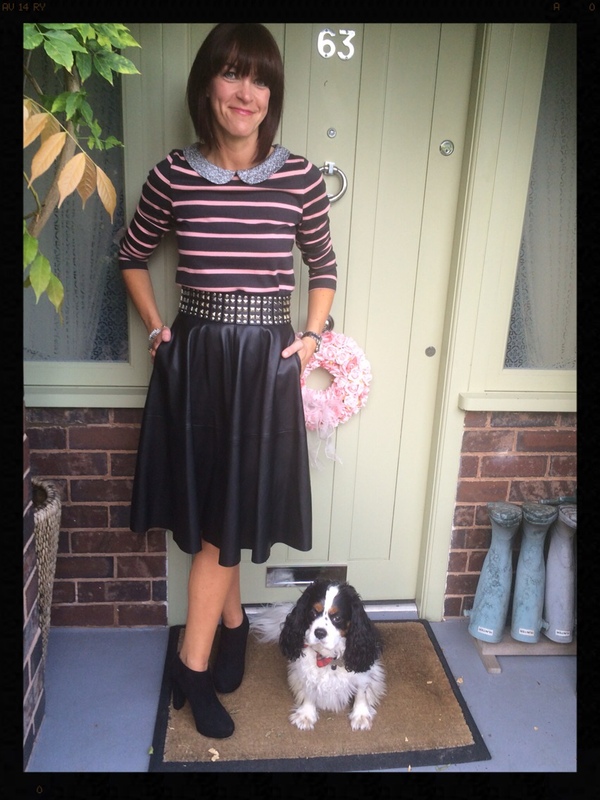 The striped breton is going to be perfect for dressing up or down & I love it teamed with my new faux leather skirt from Zara. I think this looks so pretty & different to what I'd normally wear that I can't wait for the cooler months. Teamed with my studded belt. A close up of the stunning breton. Finally for everyday style I love my new slip-ons teamed with a simple cardi & distressed jeans. A closer look at the slip ons. In fact I'm loving my slip-ons so much I'm actually wearing them with my outfit for today!! So what are you craving from Boden's new collection? I'd love to hear what's on your wish list & just to tempt you even further there's currently 10% off all orders with code 'K4P2' or 15% with code 'A67W' if you spend over £75 plus free delivery & returns with both codes not to mention a free gift for new customers! Happy shopping & I'd love to hear if anyone else is like me & arriving late to the skater shoe party!!! Have a fab Sunday, Sundays are always so much better when you know they're followed by a bank holiday Monday aren't they?!! Thanks Sue, I think I'm going to end up living in the slip ons. I seem to be having a total hot pink love in at the moment & simply can't resist anything in this colour & hope it's going to brighten up the dull winter days ahead! Hope you're having a great weekend too. Thanks Annmarie & yes you should definitely order a pair they really are super comfy. I'm looking forward to styling mine with some skirts as well. Sarah you're a girl after my own heart, I don't think you can ever have enough leopard print!!! 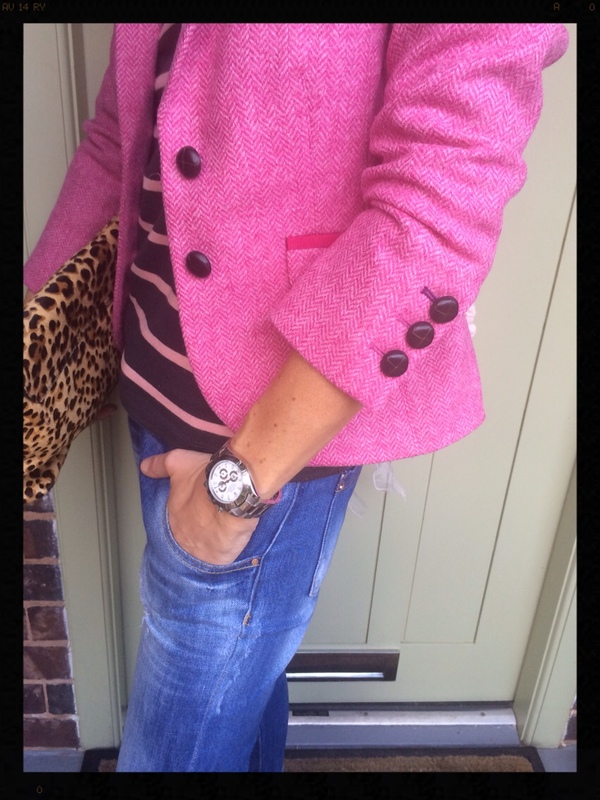 Thanks Sian, I really love teaming a tweed jacket with distressed denim & it's surprising how warm they are too. 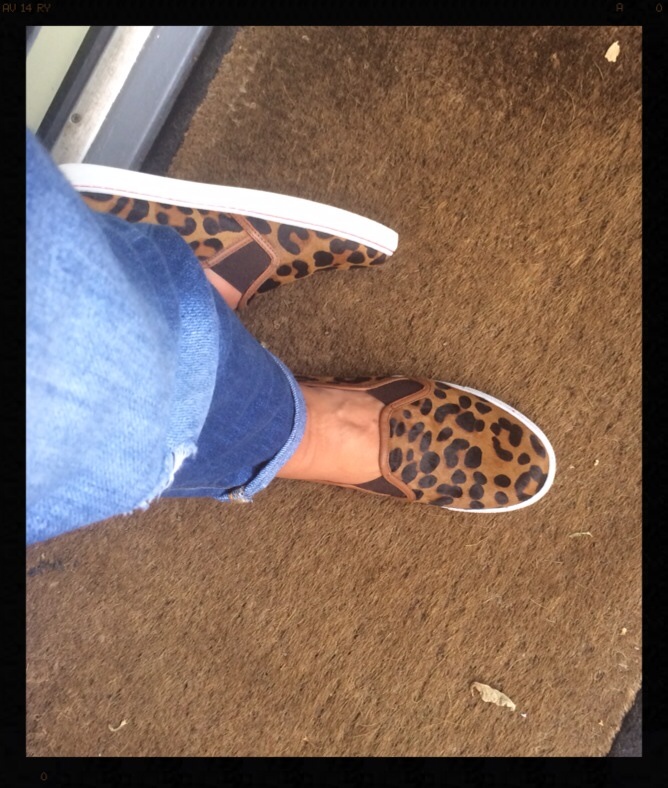 Of course you won't be surprised to hear that I couldn't resist the breton with the sparkle as for the slip ons with them being leopard print it was only ever going to be a matter of time before I caved lol!! 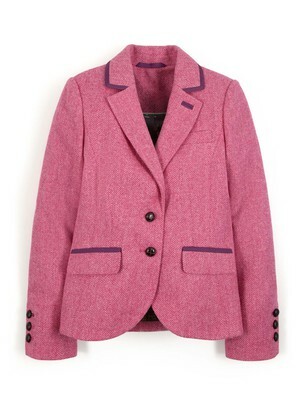 That pink tweed is to die for!! It's stunning isn't it Sara & such a gorgeous shade of pink! That pink tweed is divine. Great choice! Thanks Amber absolutely love it & I was delighted it had the pink edging as opposed to the lilac. Ooh yes you should take advantage of the discount Michelle, you can never have enough bretons!!! 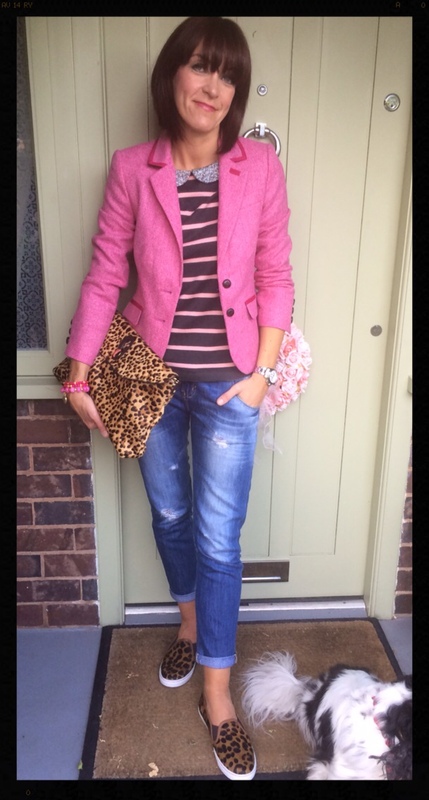 Adore the pink jacket, I'm so tempted! Just returned the cream sparkle Breton for the next size up but now wondering if the raven is something a bit different. Love the combo with the jacket. Great styling, Jane. Thanks Lena, I must admit I'm tempted to order the cream sparkle one too as they really are so pretty. Lol thanks Helen I seem to be having a faux leather love in at the moment! They're so comfy Lynne, as soon as I tried them on I knew they weren't going to be off my feet for long!! Looking forward to seeing what you've ordered. That pink was made for you. It all looks fab (jacket is extra-fab). Aww thank you! I can't wait to team the tweed jacket with my cable knit snood come the colder months!! Oh I love those shoes. They are a tad expensive though. Do you think there is enough leather for them not be smelly? I also have that same Zara t-shirt as your last pic. It is grey now, it did not survive the wash well at all, but I quite like the washed look! Hi they're gorgeous aren't they. I can't comment on the sweaty feet aspect as only worn them for the first time today (no complaints so far!) but seeing as we're coming up to the cooler months I'm guessing this won't be a problem!! 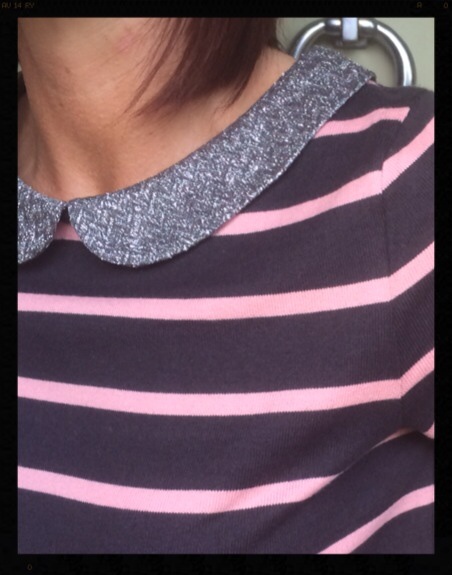 I bet your t-shirt looks fab with a vintage feel if it's gone lighter in the wash, mine was a faded black to start with which I liked as it just feels less harsh. 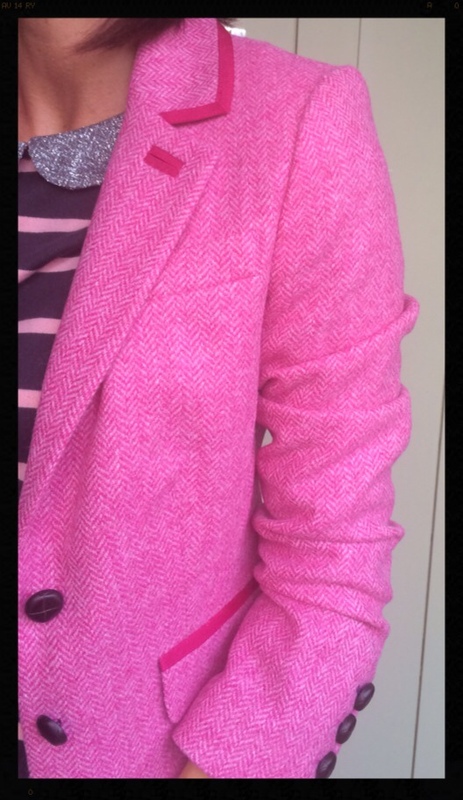 Thanks Emma, it really is a stunning jacket & the most amazing shade of pink!